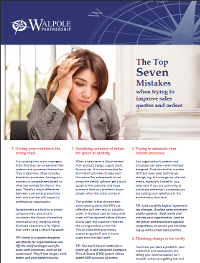 Sales teams around the world face many of the same challenges. However, larger sales forces with extra variables, products, and roles to manage, often find that those challenges intensify. For many sales teams, the biggest challenges are reducing sales cycle time, increasing order values, and improving margins. Configure, Price, Quote (CPQ) platforms can bring a 75% reduction in quote cycle time, 93% reduction in order processing time, and over 65% in labour time per quote. The positive results your business will achieve from implementing cloud-based CPQ aren’t the end of the story - there’s a lot to be learnt from how your sales process evolves after implementation. Here’s how to measure and learn from your results. Configure, Price and Quote (CPQ) systems are designed to help sales teams produce accurate quotes, customise orders, and create sales-winning proposals. Without a CPQ system, sales cycles are longer, win rates drop, and sales channels can be disjointed. Sales opportunities could be leaking from your business. Here’s how CPQ technology can plug the gaps. Configure, price, quote (CPQ) platforms can transform the speed and accuracy of quotes and sales orders, but implementing a system can be problematic. Over-planning, trying to solve too many problems at once, and not delivering for your sales team can lead to wasted budget. If you want to learn what CPQ can do for your business, Walpole Partnership, Oracle and Enigen are joining forces to host a CPQ Cloud Breakfast Briefing in London on Wednesday 18th November. The first European Oracle CPQ Cloud Breakfast Briefing kicked off in Paris last week on 28th September. Walpole Partnership and Accenture co-sponsored the event which was attended by a wide range of enterprise guests from across France. The guests heard about the benefits CPQ Cloud can bring to their business with real and practical examples. Ingmar Hermans (pictured left) took the guests through his extensive experience of CPQ and explained how the Walpole Partnership provide world class CPQ implementation services and expertise, in conjunction with Oracle and Accenture. Walpole Partnership Announces Walpole Fixed Scope Implementation Packages, an Oracle Accelerate solution for all industries. Walpole Partnership today announced Walpole Fixed Scope Implementation Packages, an Oracle Accelerate solution for all industries. Walpole Partnership is an Oracle Accelerate solution provider and a Gold level member in Oracle PartnerNetwork (OPN).